제석천과 대범천은 원래 브라만 또는 힌두교의 신상(神像)이었으나, 대승불교 이후 불법을 지키는 신상이라 여겨 사천왕상 등과 더불어 불교미술에 있어 중요한 위치를 차지해 왔다. 『삼국유사』에 의하면 우리나라에서는 조각상이 아닌 그림으로 그려졌다고 전하며, 조선시대 탱화에서 주로 예를 찾아볼 수 있으나 조각상으로는 청곡사의 것이 유일하다. 사천왕상이 위엄을 나타내는 무서운 인상임에 비해 제석·대범천상은 보살상같은 자비로운 인상이다. 탱화의 경우 보살은 양손에 물건을 들고 그 기능을 상징적으로 표현한 것과 얼굴이 금색인데 비해, 제석천과 대범천은 두 손을 합장한 경우가 많고 얼굴에 호분으로 흰색을 칠하고 있다. 청곡사의 것은 탱화의 일반적인 특징과는 다르게 입체감을 나타낸다. 양 손은 합장이 아니며 옷주름도 보통 탱화의 것과는 다르다. 회화로서는 조선 후기 불교그림에서 흔히 찾을 수 있지만, 홀로 있거나 새겨져 있는 것은 청곡사의 것이 처음이다. 조각기법은 조선 후기 양식을 따르고 있으며, 중국이나 일본에서 만든 예와는 현저한 차이를 나타내어 우리나라의 양식적 특징을 잘 나타내고 있다. The Indra and the Brahma were originally the images of gods in Brahmanism and Hinduism. After the advent of Mahayana Buddhism, however, they were regarded as gods that can guard Buddhism; thus, they have kept an important position as the image of gods in Buddhist art, together with the image of Four Guardian Kings. 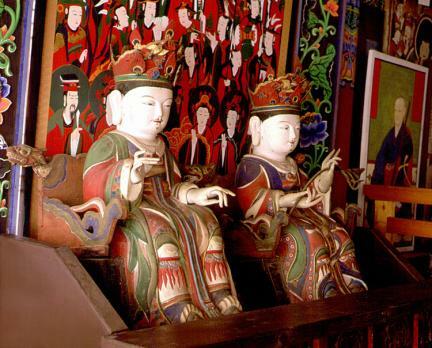 According to the book Samguk Yusa (History of the Three Kingdoms), they have been painted, not sculpted, in Korea. They were mainly discovered in the Buddhist paintings of the Joseon Dynasty. 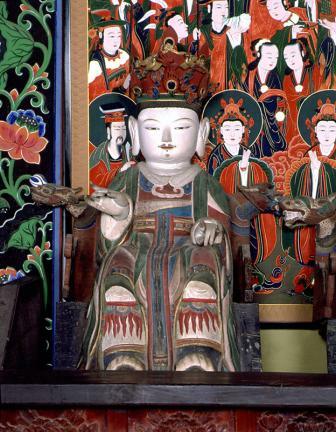 The statue at Cheonggoksa Temple is the only sculpture found in Korea. The image of Four Guardian Kings has an austere, fearful look, whereas the images of the Indra and the Brahma give a merciful impression like the image of Bodhisattva. In the case of Buddhist painting, the Bodhisattva is holding things in its two hands to express their function symbolically, and its face is painted in golden color. In many cases, the Indra and the Brahma are depicted to be joining their hands in prayer, and their faces are painted in white. 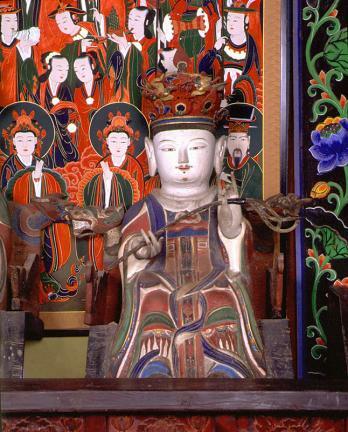 Unlike the general characteristics of Buddhist paintings, the statues at Cheonggoksa Temple are expressed in a multi-dimensional style. They do not have their hands joined together in prayer, and the pleats of their robes are depicted differently from those in Buddhist paintings. 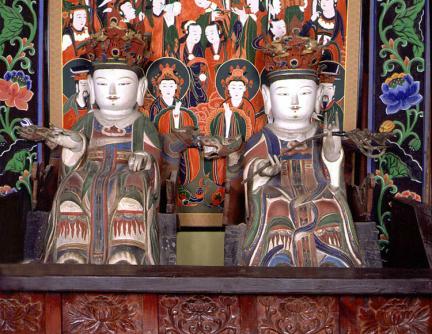 Indra and Brahma can be commonly found in the Buddhist paintings dating back to the late Joseon Dynasty, but those of Cheonggoksa Temple are the first to be placed as standalone statues. The carving techniques show the style of the late Joseon Dynasty, and they are distinctly different from those of China or Japan.